It seems to have been some time since I’ve put pen to paper, so I apparently need to get my arse into gear. Since arriving back in Siem Reap from Darwin (I left there without catching a barramundi), I’ve been incredibly busy forming a meaningful relationship with the new couch. And we’ve had some great times together but sadly it’s time for me to stand up. In between developing my couch relationship I’ve managed to help build a couple more houses with Volunteer Building Cambodia as well as a toilet or two between showers, as it’s been a very wet and wonderful rainy season here. VBC has also started to build a community centre and the organisation hopes to teach English and other skills to villagers in the local area. They already have 320 registrations. As yet, only one classroom is built, although the foundations are down for another three. 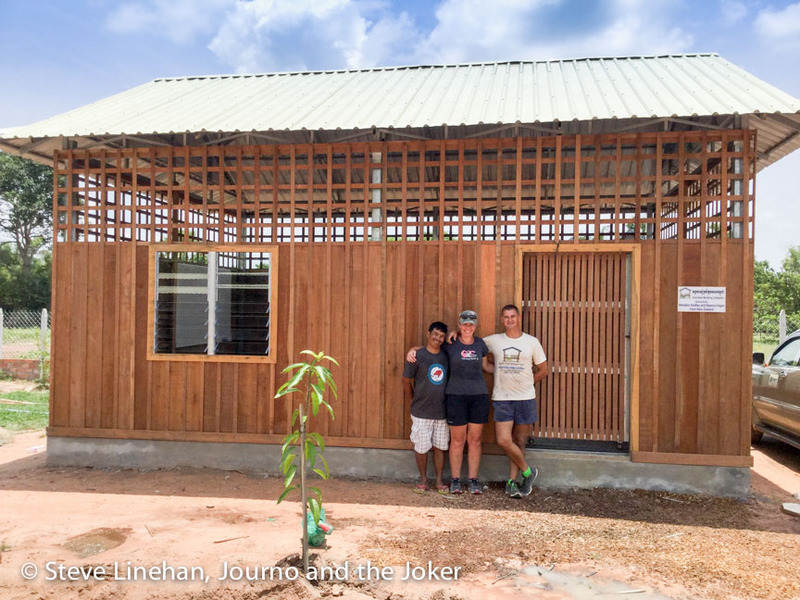 A big shout-out to Brendan and Dee from New Zealand, who funded this first classroom. It’s a fantastic contribution and will help Cambodian villagers get some education and skills. Roofs for the community centre’s library and admin building are up but as with most things here in Cambodia, fundraising is needed to complete the project. 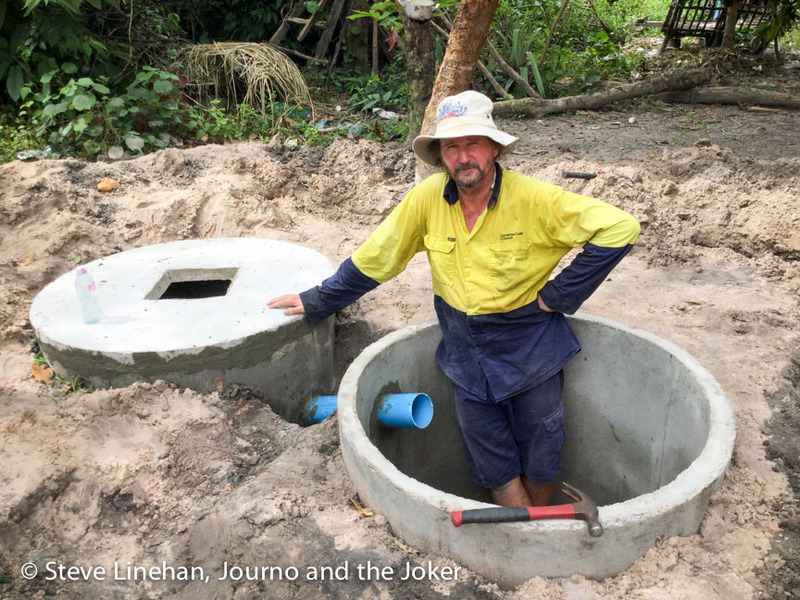 Paul and Keith, two Ausssie blokes who run the Golden Gecko Villa on Siem Reap’s 20 Street ran a Saturday afternoon fundraiser and collected more than $700, which will be put towards developing the new community centre. If you’re in Siem Reap, look them up and check out their prices (they’ve got a great pool and do the best toasted sangers in Siem Reap). You can also donate money to VBC via the website, so check it out and have a look at the great work they do. The community centre is being built on the same land as the VBC warehouse and local villagers are being taught building skills to help them gain work when the rice harvest is finished. Many of the people in these villages are very poor and don’t have an education. Even fewer have a high school education. Many do not know how to read and write Khmer. It makes it very difficult for them to get ahead. Some of these people may only earn around $50 to $80 a month but when harvest is on many are paid with bags of rice. I met one guy, who VBC built a house for last year, who worked six days a week hand loading and unloading sand onto trucks with a shovel. He was paid $100 a month. It’s very small money and not enough to support a family. Now, talking about work has made me think I will go for a massage at my favourite spa. Yes, I’ve become a bit of an expert when it comes to massage — receiving, not giving. Khmer Relief Spa is my favourite by a long shot. The prices are cheap compared to western countries but when you have an expat card you also receive a very generous discount. The Journo and I have been getting a regular one-hour relaxation massage for $10 but over the last week we managed to get a couple of freebies as some newly trained masseuses needed to practice. Being dedicated to helping Cambodians, we thought it was the least we could do. So we put our bodies on the line (on the table really) and sacrificed our time for a great cause. I had my first ever four hands massage and it was truly fantastic. This is where two massage therapists work on your body at the same time. I think I want to donate my body to the massage training school (while I’m still alive). The air-conditioned rooms are very nice on a hot Cambodian day, everything is spotless and the staff are great. A cool drink to start off, along with an icy cold towel, then some mango and warm tea to finish, makes it a great way to spend an hour or two. I’ve also been getting regular foot massages from a few places around town. It’s a great way to relax and unwind for an hour and we’ve found a few places that are really good value. Enjoy your weekend, I’m off for my next massage. So pleased you’re doing your bit for the community through the use of your body Steve. True dedication that is! Well done!